It’s About Time. From early morning yoga classes to late-night diners, 24-7 will show you how to have the time of your life 24 hours a day, 7 days a week. 3:00 p.m. Wednesday: Best Low-Tech Artwork – Berkeley Stamp & Engraving Co.
Last Day in the East Bay – Local luminaries tell how they'd spend their last 24 hours here. Perfect Day: Seeking Retail Therapy – And there's plenty to be had from the East Bay's bric-a-brac-mongers and hidden hamlets. 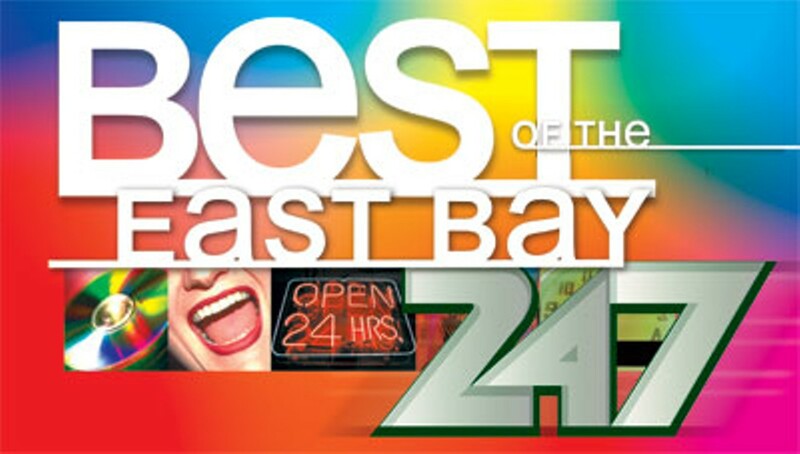 1:00 a.m. Friday: Best Place to Pick Up a DUI – 51st St., Oakland, between Hwy 24 and Piedmont Ave. Perfect Day: Twelve-Hour Escapade for Two – Eggs Benedict, Piglet flicks, ooze-walking, ringed planets -- will the fun never stop? 4:25 p.m. Friday: Best Local Microbrewery – Drake's Brewing Co. Perfect Day: Me, My Gut, and I – What if you could eat anything you wanted for a day? 10:00 a.m. Saturday: Best Place to Exhaust Your Offspring – Boomers! Perfect Day: Hoofin' It to Manzanitaville – Where you can flee the morning fog, and catch a little shade in the hot afternoon.